Brace yourself – you are about to be blown away. When visiting Cape Breton Island you will experience heart-stopping views around every corner, from the Highlands mountain range that towers above the clear blue Atlantic ocean, to the sun rising over the waters of the Bras d’Or Lakes, to the splendor and beauty of the Margaree Valley’s famous salmon rivers. Indulge in a gourmet meal at one of Sydney’s fine dining restaurants while you take in our vibrant waterfront and nearby picturesque golf greens. Cape Breton is home to the Cabot Trail, often considered one of the best driving destinations in the world. The Cabot Trail guides you from the charming village of Baddeck, through Cape Breton Highlands National Park and the glacier-carved valleys of the Acadian Forest region of Cheticamp. Waterfalls, spotting whales from the look-offs and vistas, mountain hiking trails and discovering moose in the Highlands all provide breathtaking photo opportunities of nature at its finest. Music is woven within the Cape Breton Island tapestry. Many of the world’s finest Celtic musicians call this island home and you will discover its inspiring ways. From evening ceilidhs (pronounced kay-lees) throughout the summer months, to the International Celtic Colours Festival each fall, to the Red Shoe Pub owned by the talented Rankin family, the music of Cape Breton will leave your heart singing. Signs written in Gaelic line the roads and trails throughout Cape Breton Island. Want to know how to pronounce them? Explore the Highland Village in Iona, where Cape Breton Island’s rich Gaelic heritage is reflected in the language, hands-on crafts, songs and stories of this working village. From museums, artisan galleries and shops, guided activity and sightseeing tours and golfing, Cape Breton Island provides plenty of things to see and do. The beauty of the island provides the perfect setting for our fabulous golf courses. Tour the Glenora Distillery to discover Canada’s only single-malt whiskey. Go back in time and learn about the battles between the French and the English from a soldier himself at the Fortress of Louisbourg National Historic Site. Tour the Alexander Graham Bell National Historic Site for an up-close look at early inventions of one of the best and important inventors known to man. This combination of rich culture, vibrant and lively music and breathtaking scenery around every turn is why Cape Breton Island has been voted a top island in continental North America by Travel and Leisure magazine consecutively since 2005. 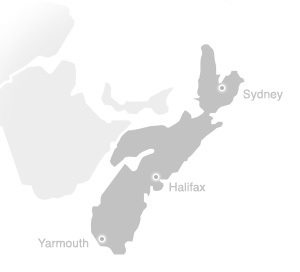 The Ceilidh Trail guides visitors from the Canso Causeway through the Margaree Valley to Margaree Harbour. Named for the traditional Gaelic gatherings of music and song, the Ceilidh Trail offers stunning vistas as it follows the shore of western Cape Breton along the Mabou Highlands, where coastal trails and sea cliffs overlook beautiful St. George’s Bay. The world famous Cabot Trail leads visitors from the charming village of Baddeck through the Margaree Valley, the Acadian village of Cheticamp, and winds its way through the highlands of the Cape Breton Highlands National Park. Be sure to take time to enjoy the view from the many look-offs located around the Trail. The Cabot Trail is lined with many amazing artisan shops, from St. Ann’s Bay to Margaree. In autumn, the vibrant reds, golds and oranges of the changing leaves make for a breathtaking drive. The Bras d’Or Lakes scenic drive circles the shoreline of Cape Breton Island’s beautiful inland sea, a haven for wildlife and seabirds. Native Mi'maq people and villages of Scottish settlers are nestled alongside the lakes known for gentle, fog-free waters, beautiful anchorages, and hundreds of coves and islands. The lakes are an international cruising destination, attracting hundreds of boating enthusiasts every year. The Fleur-de-lis Trail, Marconi Trail and Metro Cape Breton scenic drive, extending from Sydney to Port Hawkesbury, is dotted with picturesque Acadian villages. Along the rugged coastline you will find the historic Fortress of Louisbourg which stands guard overlooking the powerful Atlantic Ocean. Feel the bustle of activity as you stroll along the Sydney waterfront, a popular cruise ship destination. For the outdoor enthusiast, try your hand at surfing at Point Michaud Provincial Beach.